I'm having some fun with a Geo Tracker I picked up and I'm going to do a SHTF / Zombie Response Vehicle. When I have some pics I'll upload them. But my Question is, What would you put in there? (09-13-2012, 06:18 PM)CPratt Wrote: I'm having some fun with a Geo Tracker I picked up and I'm going to do a SHTF / Zombie Response Vehicle. If you want to bullet proof it, i have hard fiberglass ballistic plate armor for cheap. I have all intentions of bugging in, but i do have access to several quads, a boat, and a couple SUV's. The guys that rent the garage next door to my place keep all their toys there, and i have a key. They live nowhere around here, so if the SHTF, they're effectively all my assets (or perhaps more importantly, it's all my fuel- that's a lot of gas tanks to siphon). They had a 4 seat dune buggy in there for a while, but the guy took it up the mountains. Damn. Fire extinguisher, almost forget I have matches too. Truck is designed to ford up to 20" running water and also has a snow plow attachment. In truth I use it as my general farm truck, but making it look seriously prepped out is fun. 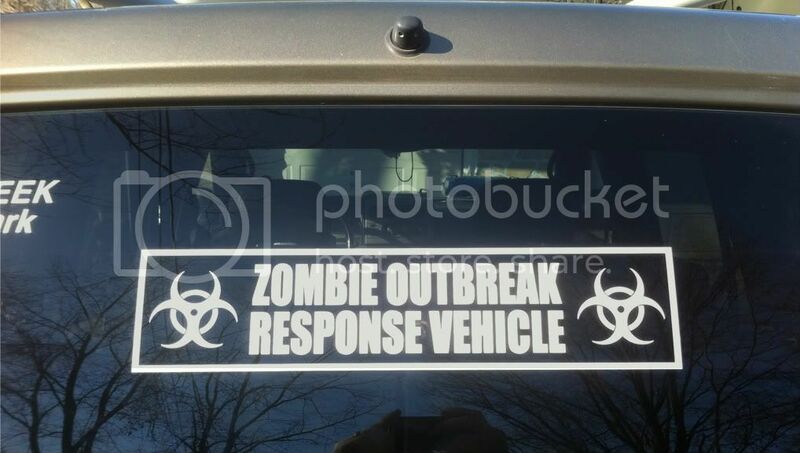 I have the logo "Zombie Response Team" in red letter across the tailgate. Not seeing anyone carrying extra ammo. I have .223, 12G, and 9mm packed in vacuum seal bags stashed in compartments in both vehicles. I don't keep any ammo preloaded in any vehicles, not the wisest thing to do in philly. (as much for thieves as for cops). However, i have numerous .30 cal cans pre loaded and clearly marked, ready to go at a moments notice. As i mentioned in the other thread, i also have 12 days water/food (under ideal circumstances), med kit, water purification and radiation gear packd and ready to go in my garage in a duffel bag as well. Things like jumper cables, emergency blankets, basic camping tools, etc, etc I generally keep in my trunk anyway. I am actually still putting together kits for each vehicle. My plan is to have spare belts, hoses and other misc. parts. I do have air compressors for both cars, tire plug kits, chains for the 4x4, tow straps, water and food in each. Also have extra anti-freeze and oil on hand, as well as a large can of tire slime. I've carried a fire extinguisher in all my cars ever since a watched a car catch fire at the order box at a Wendy's. I also have the 4D cell mag lights on hand, scanners in each one, and solar panels that can keep the battery topped off, or fully recharge it if given enough time. Of course carry jumper cables, my 4x4 has my BoB already packed in it as well as an interesting tool kit. The van I don't carry a BoB, but do carry a first aid kit. I need to service mine and get it inspected. It's been sitting idle since I don't get to off-road as much as I like any more. I'd rather have an engine that is old enough to still use points without all the new-fangled electronics for when the EMP hits . Plus I can live out my Road Warrior/ Thunderdome fantasies in the post apocalyptic wastelands of former PA.